The polarization in the Church today is a mild breeze compared with the tornado that ripped the Church apart during the lifetime of this saint. 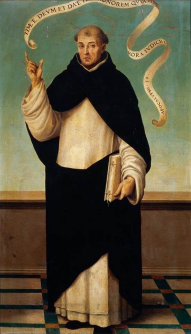 If any saint is a patron of reconciliation, Vincent Ferrer is. The Western Schism divided Christianity first between two, then three, popes. Clement VII lived at Avignon in France, Urban VI in Rome. Vincent was convinced the election of Urban was invalid though Catherine of Siena (April 29) was just as devoted a supporter of the Roman pope. In the service of Cardinal de Luna, Vincent worked to persuade Spaniards to follow Clement. When Clement died, Cardinal de Luna was elected at Avignon and became Benedict XIII. Vincent worked for him as apostolic penitentiary and Master of the Sacred Palace. But the new pope did not resign as all candidates in the conclave had sworn to do. He remained stubborn despite being deserted by the French king and nearly all of the cardinals. He tried, unsuccessfully, in 1408 and 1415, to persuade his former friend to resign. He finally concluded that Benedict was not the true pope. Though very ill, he mounted the pulpit before an assembly over which Benedict himself was presiding and thundered his denunciation of the man who had ordained him a priest. Benedict fled for his life, abandoned by those who had formerly supported him. Strangely, Vincent had no part in the Council of Constance, which ended the schism.